Japanese beauty brand Annayake will launch Miyabi Woman and Miyabi Man in December. 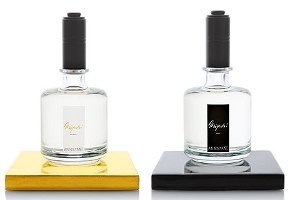 The new fragrances reportedly embody "Japanese elegance". Miyabi Woman (shown above left) ~ For the "gentle and graceful woman", featuring peach, freesia, heliotrope, sandalwood, tonka bean, amber and white musk. Miyabi Man (shown above right) - For "an aura of timeless masculinity", with notes of blood orange, anise, cardamom, clove, nutmeg, violet leaves, sandalwood, white musk and tonka bean. Lovin the bottles!! The mens sounds quite nice doesnt it! I hope I could find them in the US or online. I like those bottles too. Annayake is not easy to find in the US. I do know some of the discounters carry the line, but don’t know who else. Wasn’t there a similarly named Annayaké before? Miyako/Miyamo/Miyabo/something? They’re all Japanese women’s names. There’s a Miyako. And Matsuri. I have several although I like the woodier ones better (Miyake/Tsukimi). The men’s sounds great, and joining the chorus of love for the bottle. I want the men’s too…the peach & freesia I can probably do without. Seems to be a bit of peach around at the moment – or maybe I’m noticing it because I don’t like peach. The bottles remind me of nail polish. They remind me of lab beakers, for some reason. I’d like the bottles even more if they came with those tile/pedestal things. That’s so funny …. in my mind they DID come with those tiles! I’d attached them mentally. If only the one for women had more citrus top notes, It might be love at first sniff. Right now, it is very similar to Jlo’s Live Lux, which I like but I seldom wear it, because it smells too much like the other fruitys. I’m surprised I don’t draw flies with it. Almost everything turns out to have at least some citrus in the top notes though! Myabi woman smells like bubble gum to me. Oh, what a disconnect with the bottle! Sometimes I am stubborn, and try a scent again, although I didn’t like it at the first sniff. My opinion stays the same with this second sniff. It reminds me also a little bit of Kenzo Amour (which I love), but this one is much sweeter (on my skin) and there is something in it, that disturbs me. I like Kenzo Amour too, but if it’s much sweeter than that I might not like it either. When I received the perfume I didn’t know it was supposed to be pricey and classy. My first thought was ‘my, what an ugly bottle, and the smell to go with’. Much as I try I cannot shake that first impression and by the perfume’s resounding non-success I can see I’m not the only one. Underneath the lovely, spiky dirty-sock smell I do detect some freesia though, for all the 5 minutes it lasts on my skin and the rest of 6 hours on my clothes. I should have prohibited him buying me perfumes after gifting bubbly me with JPG Classique X. Nice, but not my cup of tea either.